Here is a link (http://blastr.com/2010/09/best-genre-tv-episodes.php) to a pretty good list of great TV science fiction episodes. I’ve seen most of these and agree that they should be on the list. Especially Hush for Buffy, Blink for Dr. Who, and Out of Gas for Firefly (though the Firefly pilot is one of the best pilots ever, IMHO). I’m not sure the Twilight Zone episode was the best, but it was very good. I think I might have gone with Time Enough at Last (Burgess Meredeth) or To Serve Man. Call me old fashioned, but I do like the occasional destruction of the Earth movie, even those that are totally implausible. Which covers most of them, now that I think about it. These movies are rich sources of bad science, bad engineering, bad movie-making, and bad acting. The good ones let you forget about all that, the bad ones, well, sometimes you just want to throw a boot through the screen. Of course the really bad ones are almost as good as the good ones, entertainment-wise. I’ve got a couple of examples here. Okay, so has Hollywood learned anything in the last 58 years? Let’s take a look. In WWC, a star, Bellus, and its companion planet, Zyra, are entering our solar system. Zyra will pass close to the Earth and 19 days later Bellus will hit the Earth and destroy it. In 2012 the Earth’s core is somehow being cooked by neutrinos from the sun. As predicted by the Mayans. Right. At least in 1951 they didn’t completely violate the laws of physics. In both movies the heroes will eventually be saved by arks that are built to save the human race. But in WWC, the heroes are the ones building the ships and a lot of the movie concentrates on those challenges. In 2012 most of the action (mostly improbable and all CGI) and most of the movie is the heroes trying to get to the ships. WWC main characters include a caring older scientist, a young doctor/pilot, a young pilot, a female scientist, and a crotchety rich guy. 2012 main characters include a caring young scientist, a writer, a doctor/pilot, a female scientist, and an obnoxious rich guy. I almost gave the edge to WWC for having a relatively strong female scientist character (and far fewer character stereotypes than 2012), but later in the movie somehow she’s relegated to handing out sandwiches to the workers so I have to call them even on characters. Neither rich guy makes it, by the way. Even though 2012 had the ridiculous neutrino premise, they wisely swept past that and any other science to concentrate on CGI tidal waves and earthquakes. Actually, though, both movies did a decent job of showing some of the uncertainties of predictions and the time and effort it takes for scientists to come to a consensus. Both also try to show the interaction of scientists with politicians – especially in 2012 where there are a few pretty good scenes between the hero scientist and the White House chief of staff who I think we are supposed to hate, but I think he had some pretty good points throughout the movie. However implausible the cause of it, if you’re considering the extinction of the human race a lot of hard decisions would have to be made. Where to start. 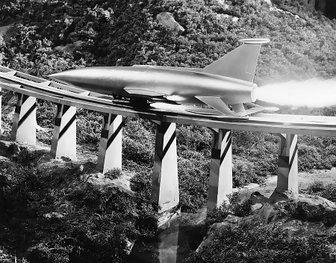 I’m no rocket scientist, so I can hardly comment on the portrayal of the rocket-ark in WWC or the very cool ski jump take-off track. I am sure the rocket was undersized and would never achieve orbit, much less get forty people to Zyra, but for being just six years past the V-2 days, I think they did a decent job. What they did even better was the positive and underplayed portrayal of the head engineer who was stalwart and competent and a credit to his profession. Engineering in 2012 was absent for most of the movie and only at the end do we see what has been happening behind the scenes. Spoiler alert. You have to give them credit for building the four arks in China — that is the only country that could pull off such a feat in three years. Or ever. The West is rapidly losing the ability to design and build massive projects, let alone manage them. On the other hand, and as usual with Hollywood, the engineering had to suffer in order to provide drama. In this case it is the ridiculous premise that the ark that the hero just sneaked onto can’t use its engines until the passenger door is closed. Sure, it’s a big door, but not that big, especially compared to the size of the ark. It was sort of like saying that a supertanker can’t get underway until all the portholes are shut. The size of the things are also problematic with the way they are sitting up on pylons just waiting for that big tsunami to come and float them off. No way the arks would have the longitudinal strength to be docked that way. Speaking of that, was I the only one who was hoping the water would just lap against the pylons and then recede, leaving them high and dry? I wonder if the DVD has that alternative ending. Do you suppose that Hollywood writers and directors get to their positions because they can only think in clichés, or do you think that just ends up as the easiest thing to do in the end? Are clichés and CGI effect the only thing we’ll have in movies in the future? In any case, WWC doesn’t entirely fall into this lazy trap, and the clichés it does use — crotchety rich guy; little boy saved by hero; noble self sacrifice — are done pretty well and subtly so it doesn’t seem as hackneyed as 2012. In 2012 the clichés are flying right and left as fast as the numerous CGI fireballs. Noble president; fathers making last phone calls home; destruction of most notable landmarks (including the dome of St. Peters Cathedral which miraculously maintains its shape even when on its side on top of a throng of catholics); the working class hero who is really a talented writer; the crackpot conspiracy nut; good scientists and bad politicians; a love triangle easily solved by killing off the boring boyfriend (who saved everyone at least twice — no good deed goes unpunished); and finally the hero going off on a suicide mission to save the ark (only it wasn’t and he survives). I should add the now-cliched CGI disaster scenes, but those have, I think, gone beyond the cliché and have become simply requirements for the American audience. For what it’s worth, they were done pretty well. Just like the clichés, this showed a great difference between WWC and 2012. In the former case, the mission was successful due to the hard work and talent of the scientists and engineers. Perhaps the only DEM here was the fact that Zyra was conveniently conducive to human life. In 2012, on the other hand, the DEM is so implausible and heavy handed that I wonder if they just threw it in there when they realized their timeline was all screwed up (or they underestimated the range of the Antonov). Yes, when you are running out of fuel in your airplane don’t despair, just let the crust of the earth change so you can make an emergency landing within walking distance to the arks! Yeah, that’s credible. I won’t even get into all the saved-by-the-skin-of-their-teeth car and airplane stunts. Okay, so 2012 was better than I expected due, in part, to great casting. You can’t go too far wrong with Cusack, Chiwetel Ejiofor, Amanda Peet, and a bunch of good character actors. Yeah, the premise was ridiculous and the clichés were out of control, but it was pretty in a Godzilla destroying Tokyo way and it was entertaining (as long as you disconnect your logic circuits before watching it). WWC is classic 1950’s scifi with decent acting, a sensible script, and great, for then, effects. (In particular, I think the helicopter roof rescue was amazing and probably wouldn’t even be attempted today in our litigious environment.) The feeling of the movie was more to my liking too. Closer and less fragmented than 2012 and more willing to let the plot move to its conclusion without feeling the need to throw in gratuitous melodrama. Considering the time in which each movie was made, I would have to say that WWC was remarkable, and 2012 a slightly better than average CGI fest. The most important thing in both movies is that the cute little dogs survive. Five billion people die in each film, but the pooches survive. And the Audience cheers. Sheesh.